The Evil Overlord has condemned the Troll Islands to constant darkness by using the powers of Fire, Water, Earth, and Air to block out all light. 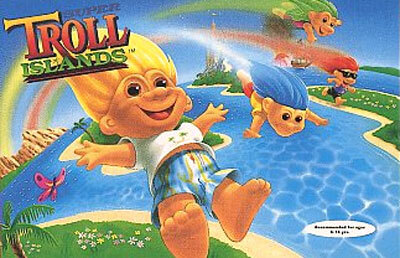 Now, it's up to you and four Magical Trolls to bring light back to the Troll Islands and vanquish the Overlord. You can choose from any of the four Trolls and venture into the 10 gigantic levels that will put all your Troll skills to the test: running, jumping, swimming, and even fighting! As you progress, look for Color Spins that will give you extra energy and Custard Pies that come in handy as weapons. The fate of the Troll Islands is in your capable hands and the Overlord is waiting for you!